Rich, complex and bittersweet, this is undoubtedly one of the most fantastic chocolate cakes I’ve ever made. After my first bite I knew it would be my new “go-to” classic chocolate cake and I had to share the recipe with you. I’ll just say “you’re welcome” now because I know it’ll be one of the best cakes you’ve ever eaten and you’re going to LOVE it! You’re welcome. Infallibly moist and flavorful, this cake is made with both cocoa powder and melted dark chocolate. It’s fine-crumb texture results from straining the batter through a sieve to remove any lumps before baking. I’ve never tried such a technique before, but I learned that straining out the lumps, rather than trying to stir them in the batter, prevents over mixing and leads to a dense cake. This technique does require a bit of elbow grease, but the cake is worth the extra effort. I can’t emphasize enough that the quality of the chocolate used is what can elevate a bite of cake into a moment of sheer bliss. No matter how lovely your decorations or technique, if you use inferior chocolate your dessert simply won’t be as amazing. When making chocolate desserts, the chocolate manufacturers I trust are Callebaut and Valrhona. There are also equally exceptional ones like El Rey, Michel Cluizel, Scharffen Berger and perhaps others I’m not yet aware. I buy mine at supermarkets or online. A quick note on the difference between cocoa and cacao—it’s not just about the placement of the vowels—because this recipe calls for both. Although you might hear the words used interchangeably in colloquial English, cacao actually refers to the raw, unprocessed form of chocolate which retains more of its natural nutrients and is most often used in raw recipes. Cocoa is the type of powder we typically see on the grocery store shelves and use in our baked goods. Although they may sound similar, both are unique when it comes to taste, nutrition, and cost. Cacao refers to the raw form of chocolate, including the tree and bean. Raw cacao powder is not roasted, relatively unprocessed, and contains no sugar or cocoa butter. Cacao is the purest form of chocolate you can consume. It is raw and much less processed than cocoa powder. Thought to be the highest source of antioxidants and the highest source of magnesium of all foods, cacao has been used for its health benefits by many cultures throughout the years. Cocoa, in comparison, is the term used to refer to the heated form of cacao. Cocoa powder has been roasted, ground, and sometimes mixed with a sweetener and cocoa butter. Though cocoa may seem inferior to raw cacao, it’s actually still quite good for you provided you choose a variety without added sugars, milk fats or oils. The original recipe for this cake suggests using natural cocoa powder not Dutch-processed, as the Dutch-processed cocoa has been treated with an alkalizing agent that heightens the color but gives it a milder flavor. For this recipe, it is important to use natural product such as Valrhona or Scharffen Berger to attain a deep, dark chocolate flavor. The recipe also calls for 70 percent cacao chocolate. The cacao percentage indicates the amount of cacao in relation to sugar. Thus a bar containing 70 percent cacao has 30 percent sugar, with less than one-half percent vanilla or lecithin. Of that 70 percent cacao, about half is cocoa solids and the other half is cocoa butter—for that magnificent melt-in-your-mouth consistency. Keep in mind the higher the percentage of cacao, the deeper, darker, and more pronounced the chocolate flavor. Another way to think of it is that if the cacao percentage dips below 50 percent, that chocolate bar contains more sugar than cacao, meaning less chocolate flavor. Chocolate cakes are not often paired with lemon, but I find the combination completely tantalizing. 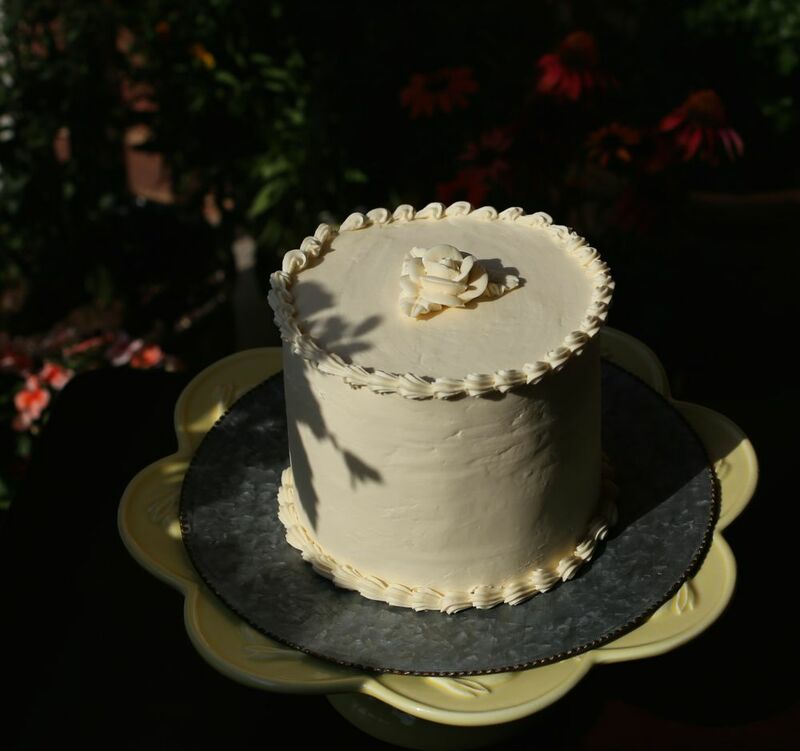 I frosted this chocolate cake with a light and lemony Italian meringue buttercream. 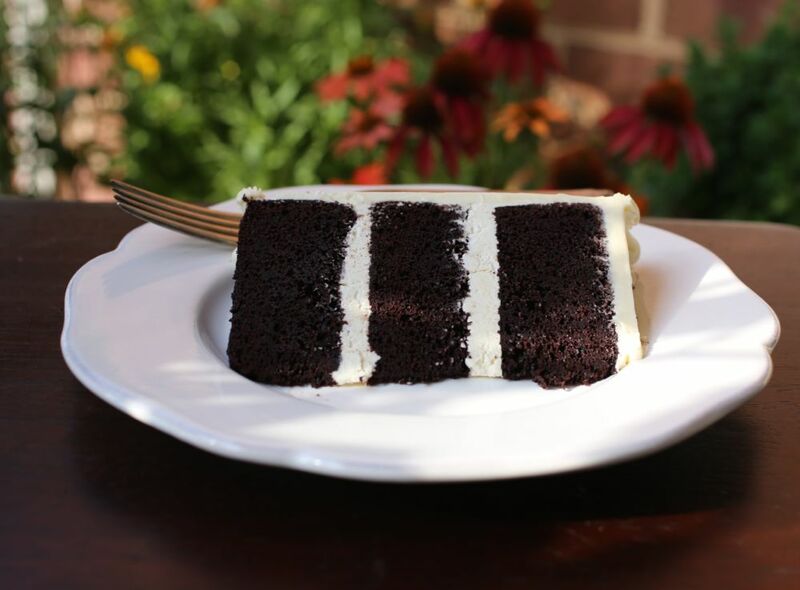 It’s a citrus celebration that pairs beautifully with the rich, moist and dense chocolate cake. In other variations I’ve also paired this cake with aRaspberry Italian Meringue Buttercream or Bittersweet Chocolate Ganache. Liberally butter two 6-by-3-inch or three 6-by-2-inch cake pans and dust with sifted cocoa powder. Tap out the excess cocoa. In the bowl of a stand mixer fitted with the whisk attachment, whisk the eggs on high speed until foamy, about 2 minutes. Reduce the speed to low and slowly pour in the oil, whisking until combined, about 30 seconds. Raise the speed to medium and whisk until fully incorporated, about 30 seconds longer. Pour the batter through a medium-mesh sieve into a large measuring cup or bowl to remove any lumps. Press against the solids in the sieve with a rubber spatula to push through as much batter as possible, then discard the lumps. Divide the batter between the prepared pans. Bake until the tops spring back when lightly pressed and a tester inserted in the centers comes out clean, about 35-45 minutes. Transfer to wire racks and let cool in the pans for about 20 minutes. When the cakes are cooled enough to handle the pans but still a tad warm to the touch, carefully run an offset spatula around the edges of the pans to loosen them, then invert the cakes onto the racks and remove the pans. Wrap the cakes tightly in plastic wrap and refrigerate to ensure that the interiors are completely cooled before decorating, at least 1 hour or for up to 3 days. To freeze, wrap tightly in a second layer of plastic and store in the freezer up to 2 months. Also, the original recipe uses vegetable oil, but I’ve decided to bake it with unrefined coconut oil instead. In one of my trial, I made this cake with coconut sugar. Although still very good, it wasn’t the flavor I was after for me new go-to chocolate cake. Feel free to try the different oils and sugar to see if you have a preference. As baking is truly a science, I recommend using a scale to measure your ingredients for the best and most accurate results. Kitchen scales are available online or at home goods stores at affordable prices. 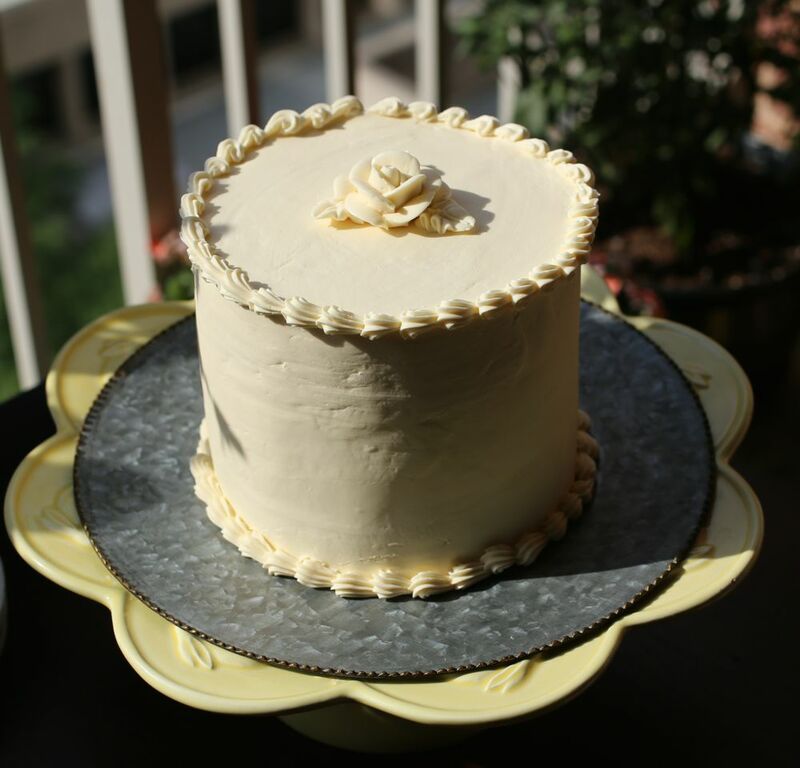 ¼-½ cup or more lemon curd, the amount used depends on how lemony or tart you’d like the frosting. I used about 1/3 cup. In a small saucepan over medium heat, bring sugar and water to a boil. Clip a candy thermometer onto the saucepan. Boil the syrup, brushing down the sides of the pan with a pastry brush dipped in water to prevent crystallization, until the syrup registers 248 degrees F, about 5 to 10 minutes. Meanwhile, in the bowl of an electric mixer fitted with the whisk attachment, beat egg whites and cream of tartar, and beat on medium high until soft peaks form. When the sugar syrup reaches 248 degrees F, with the mixer running on low to medium speed, pour the sugar syrup in a steady stream into the egg whites (pour down the side of the bowl to prevent splattering). When all the syrup has been added, beat on high speed and continue to whisk until the mixture cools to room temperature, about 5 to 10 minutes. Only when the meringue has cooled (to about 70 to 75 degrees F) should you begin adding the butter. This is very important! Reduce the speed to medium, add the butter one tablespoon at a time. Wait until each tablespoon has been incorporated before adding another. If the mixture begins to look curdled at any point, raise the speed to high and continue to add tablespoon-size pieces of butter. Again, make sure each is completely incorporated before adding another. When all the butter has been added, the frosting should be thick and smooth. Add vanilla raspberry syrup and mix to combine. Use immediately or cover and refrigerate until needed. If your frosting is chilled, bring to room temperature before using. You may want to beat it a few seconds until soft and spreadable again. THANK YOU!! THANK YOU!! You are my new guru for chocolate cake Martine!! You’re so welcome! Happy to share. We love this cake! Thanks Fae. Glad you like it. Your chocolate cake looks divine! Somebody gave me chocolate extract as a gift. Have you ever used it? Hi Tanya, thank you! I love this cake! I have never used chocolate extract before, but as I understand, what the chocolate extract does is enhance the chocolate and highlight it. I’d recommend to try it! As this cake calls for both cocoa powder and melted chocolate, the chocolate flavor is already enhanced, but I don’t think adding chocolate extract will do any harm. If you can, please try the cake with and without the extract and please let me know what you think!!! I’ll look for some chocolate extract and will try to compare as well. If you use the extract, I’d recommend using the same amount as vanilla extract (1/2 teaspoon). Some might suggest to use the chocolate extract instead of the vanilla, but I’d suggest to use both as the flavors are complimentary! Good luck and please let me know what you think!!!! Thanks for all your coaching on this cake, the correct chocolate, the specific details about the frosting (the crumb layer)!! This is truly the most amazing cake I have tasted and then attempted to make myself! I always thought the cake was all about the right frosting, but this cake made me realize that the cake can be amazing unto itself. 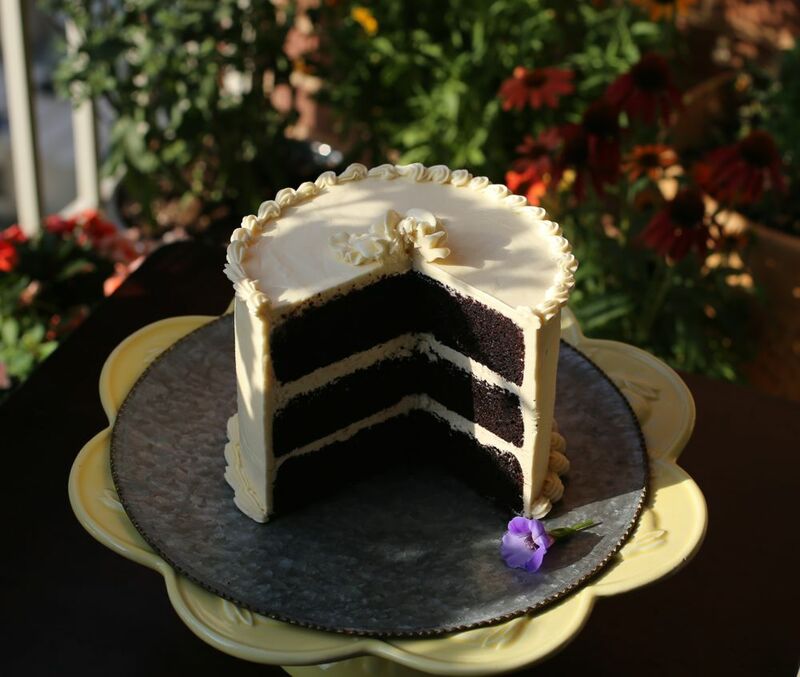 I never realized that a cake could have such a delicate, refined, and deep flavor. AND, then, this frosting could literally be eaten in a bowl by the spoonful!! SO amazing!! Thank you! You’re so welcome!! It was my pleasure. 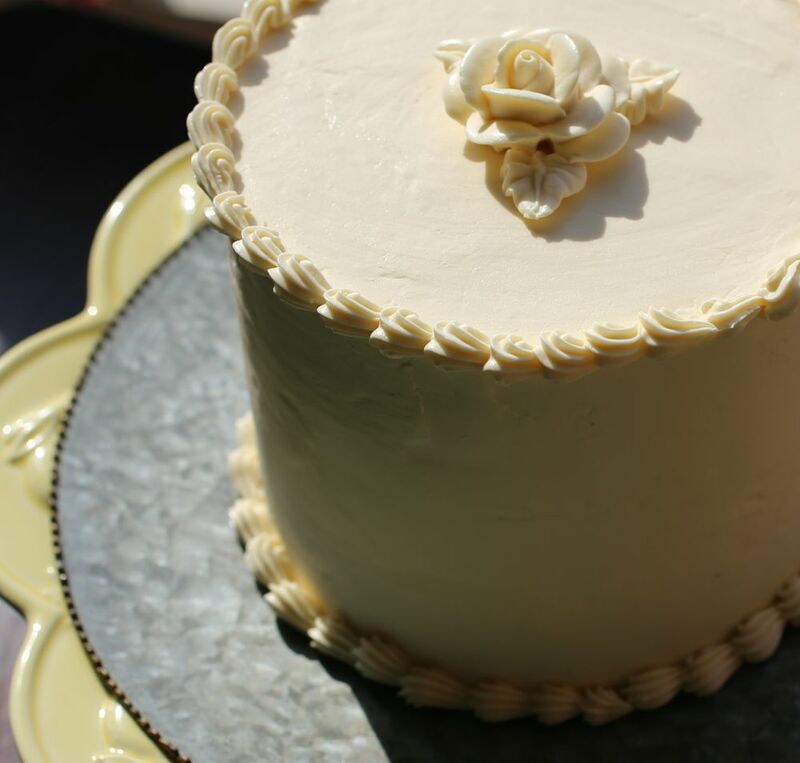 So happy this cake and frosting turned out so well for you!